Unframed canvas artwork is now a staple in home fashion, adding a touch of boho elegance to any room. Lucky for you, this great home décor is easy to hang because of its light weight and supportive framework. Follow these simple directions to have your walls covered in these classy pieces in no time. Select the piece you would like to hang and choose the room you would like to hang it in. Eye-ball the wall space available in the chosen room and pick several locations where you think the piece might look best. Ask a friend or family member to help you by holding the piece up in those spots and at different heights while you move around the room and view it from different angles. Reverse places with your assistant and get her reaction as well. Decide on a place and the height at which you want the canvas picture to be hung and, using a pencil, lightly mark the wall at the top of the canvas on both sides of the center support bar. This doesn’t need to be perfect on each side, just a guess. Using a measuring tape, measure the length from the floor to one of the marks you just made, and make a small, light mark about 2 inches below this. Align the top of a level with this mark you just made and make it straight horizontally. Darken the mark you made slightly, and then find the second mark you made on the wall for the other side of the crossbar. Make a new mark against the level at about the same horizontal space as the original crossbar mark, and remove the level. You should now have two marks on an equal and straight line a little more than the crossbar’s width apart 2 inches below where you want the top of your painting to be. Hammer two long nails into each of these marks, making sure they enter the wall straight. Leave at least an inch of the nail exposed to hang the picture on. Using a white eraser, gently erase the pencil marks you made on the wall. Pick up your picture and center the crossbar between the two nails. The nails should support the picture on both sides of the crossbar. 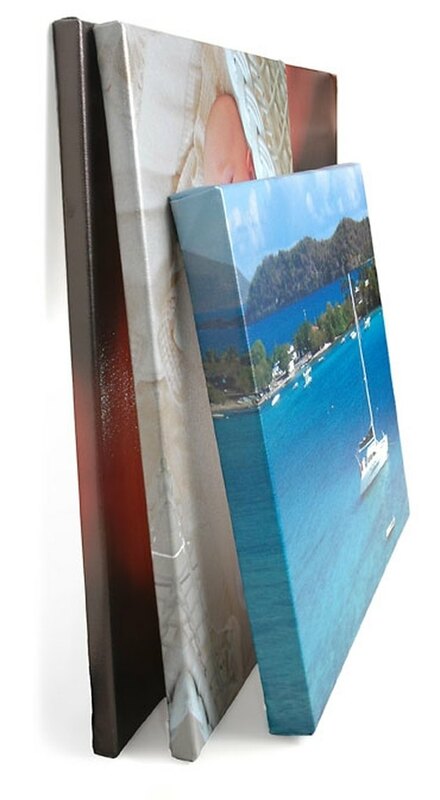 Step back and admire–you have hung your canvas painting successfully.